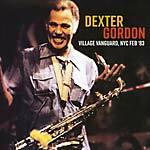 Dexter Gordon, live at the Village Vanguard, New York City on February, 27th 1983. Dexter Gordon's long and remarkable career saw him perform alongside Lester Young, Lionel Hampton, Charlie Parker, Louis Armstrong, John Coltrane and many others. After a long spell in Europe, he returned to the US in 1976, and was named Down Beat Musician of the Year in 1978 and 1980. This superb set was broadcast by National Public Radio, and finds the great saxophonist celebrating his 60th birthday in typically authoritative and entertaining style. Digitally remastered here for greatly enhanced sound quality. Presented with background notes and images. 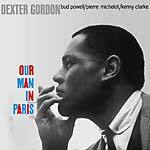 Doxy present a reissue of Dexter Gordon's Our Man In Paris (1963). This 1963 date is titled for Dexter Gordon's living in self-imposed Parisian exile and recording there with two other expatriates and a French native. Along with Gordon, pianist Bud Powell and Kenny "Klook" Clarke were living in the "City of Lights" and were joined by the brilliant French bassman Pierre Michelot. Gordon is at the very top of his game here. His playing is crisp, tight, and full of playful fury. Powell, who at this stage of his life was almost continually plagued by personal problems, never sounded better than he does in this session. His playing is a tad more laid-back here, but is nonetheless full of the brilliant harmonic asides and incendiary single-note runs he is legendary for. The rhythm section is close-knit and stop-on-a-dime accurate. Numbered first press, edition of 500.